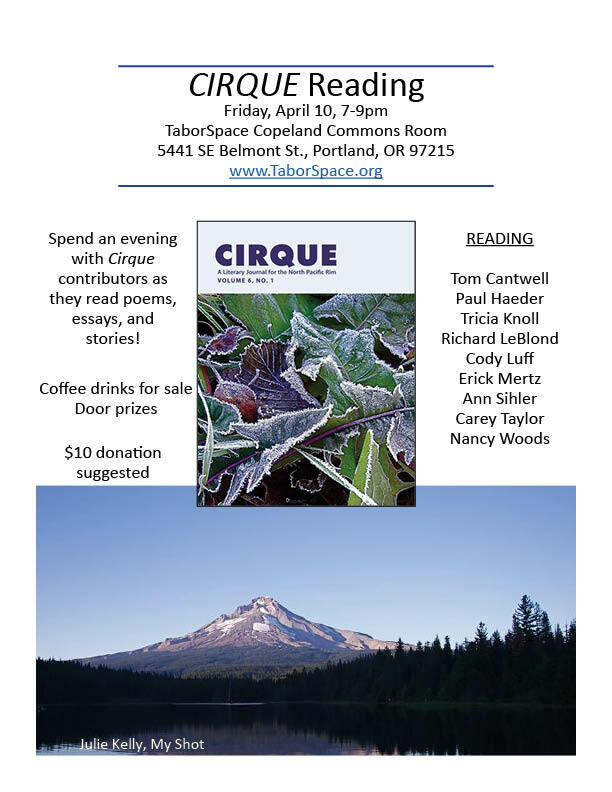 I will be reading with other Cirque contributors in Portland this Friday. This is a fundraiser for this beautiful Alaska-based journal, which publishes writers from the North Pacific Rim. The Winter Solstice issue of Cirque: A Literary Journal for the North Pacific Rim, is now available online and includes my short story, “Other Bars.” Cirque is a beautiful journal, available online and in print, published by passionate people. I have been dreaming in black and white lately. Each dream shot through with hazy Noir outlines, filled with rain and streetlights, beautiful old cars, and the sounds of sleeping cities. There is no great struggle in these dreams, no violence or witty detectives. Instead I am working at jobs I remember from my youth. Hauling hay bales in black and white fields, processing chicken for frying in inky vats of oil. Perhaps the most fitting is my time as a bell hop. Long hallways punctured by identical doors rich in shadow. Tips given in coins that catch the light and jingled in my pocket as I slip down the hallway. In reality my time as a bellhop was little more than a footnote in my time in the professional world. My tips feed me, my pay dissolved into my gas tank and rent check. It was a balancing act that so very many people participate in daily. But in these dreams I am young, my face not exactly smiling but very much alive, my knees ache-free and impervious to stairs. I am always on shift, always attending guests, unloading luggage and listening to the hiss of my service radio. The dream me is somewhere between happiness and contentment as he walks the black and white expanse of a nearly forgotten hotel. There are moments in this dream where I am merely an observer, watching myself play out a life I left twenty years ago. There are other moments still that I am that young man again and I experience a thick envy that wakes me from my dream. I sit in the darkness of my bedroom and my envy turns to a childish grief, the grief one builds by counting gray hairs in the mirror. In this darkness, my room made black and white by dimness, I turn to the sleeping woman next to me. Her hair is a slow curl on her pillow, the cat tucked comfortably under one of her arms, her skin reflecting the streetlight beyond our window. My grief fades away and the dream of me experiences his own burst of envy as I lay back to sleep next to this beautiful woman who even in the darkness is the color of the sun.